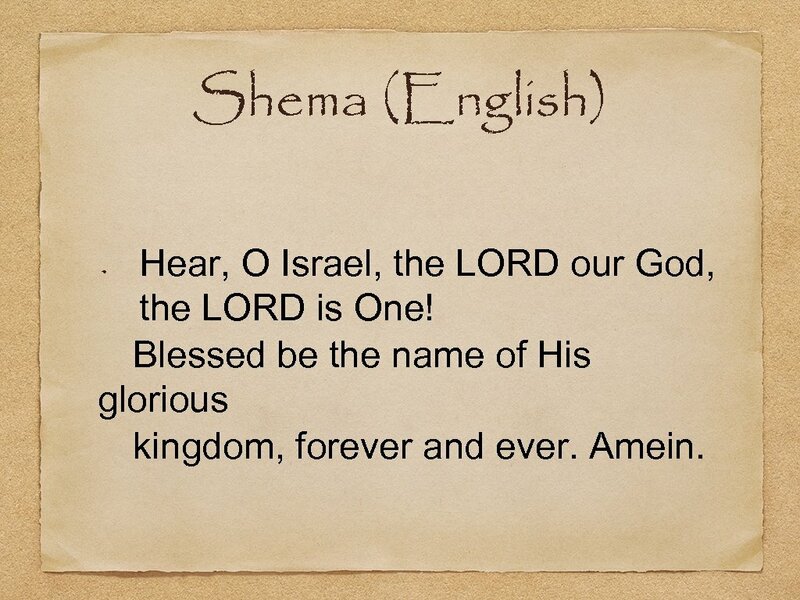 Shema (English) Hear, O Israel, the LORD our God, the LORD is One! Blessed be the name of His glorious kingdom, forever and ever. Amein. Va’havata V’havata et Adonai Eloheycha, b’chol le’vavecha, Uv chol nafshecha, uv’chol m’odecha. 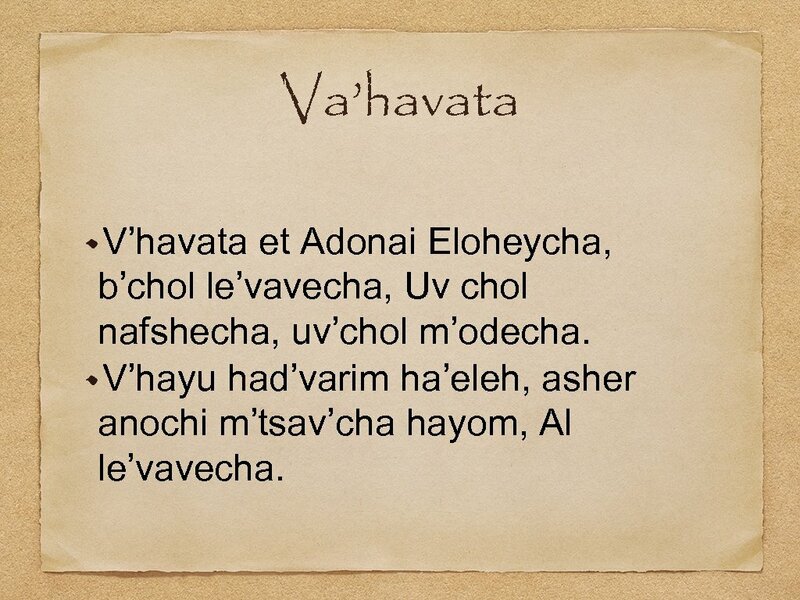 V’hayu had’varim ha’eleh, asher anochi m’tsav’cha hayom, Al le’vavecha. V’shinantam l’vaneicha, v’dibarta bam, b’shivtecha b’veiteycha, Uv’lechtecha vaderech, uv’shochb’cha uv’kumecha Uk’shartam le’ot al yadecha, v’hayu l’totafot bain einecha. 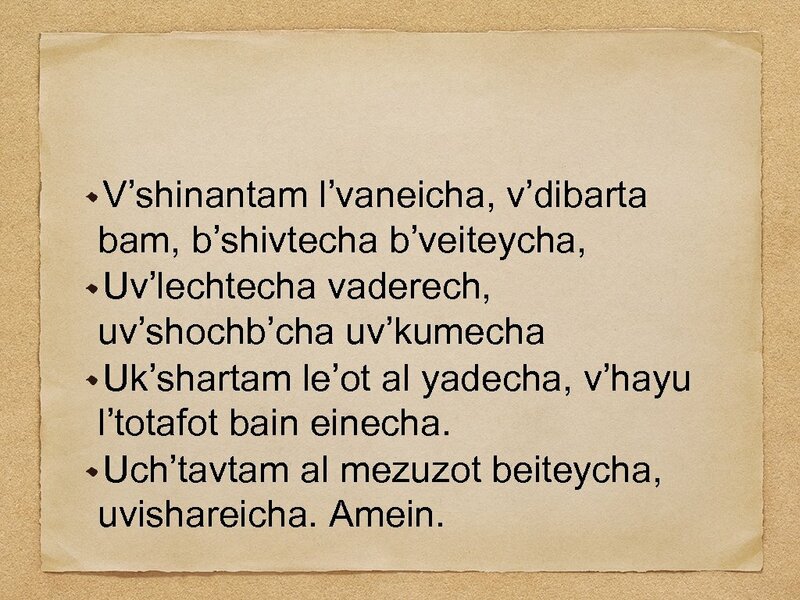 Uch’tavtam al mezuzot beiteycha, uvishareicha. Amein. 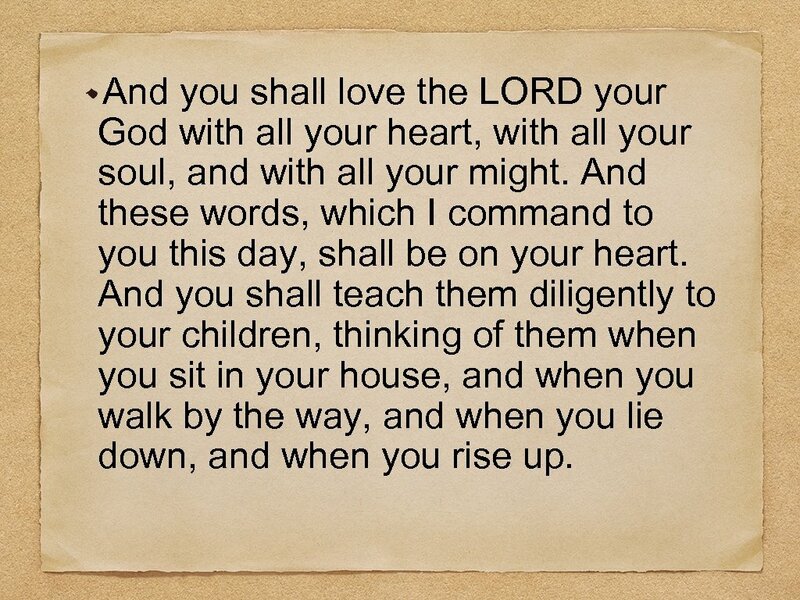 And you shall love the LORD your God with all your heart, with all your soul, and with all your might. And these words, which I command to you this day, shall be on your heart. And you shall teach them diligently to your children, thinking of them when you sit in your house, and when you walk by the way, and when you lie down, and when you rise up. 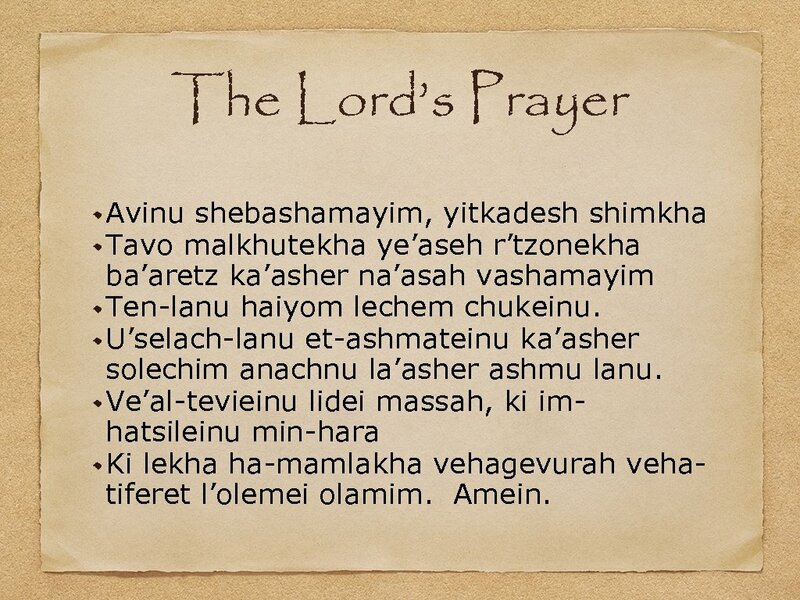 The Lord’s Prayer Avinu shebashamayim, yitkadesh shimkha Tavo malkhutekha ye’aseh r’tzonekha ba’aretz ka’asher na’asah vashamayim Ten-lanu haiyom lechem chukeinu. U’selach-lanu et-ashmateinu ka’asher solechim anachnu la’asher ashmu lanu. Ve’al-tevieinu lidei massah, ki imhatsileinu min-hara Ki lekha ha-mamlakha vehagevurah vehatiferet l’olemei olamim. Amein. 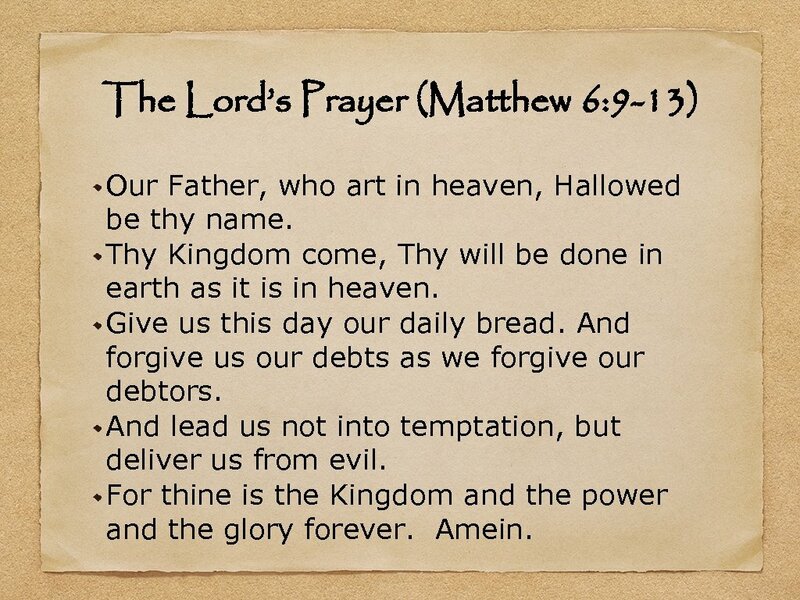 The Lord’s Prayer (Matthew 6: 9 -13) Our Father, who art in heaven, Hallowed be thy name. Thy Kingdom come, Thy will be done in earth as it is in heaven. Give us this day our daily bread. And forgive us our debts as we forgive our debtors. And lead us not into temptation, but deliver us from evil. For thine is the Kingdom and the power and the glory forever. Amein. 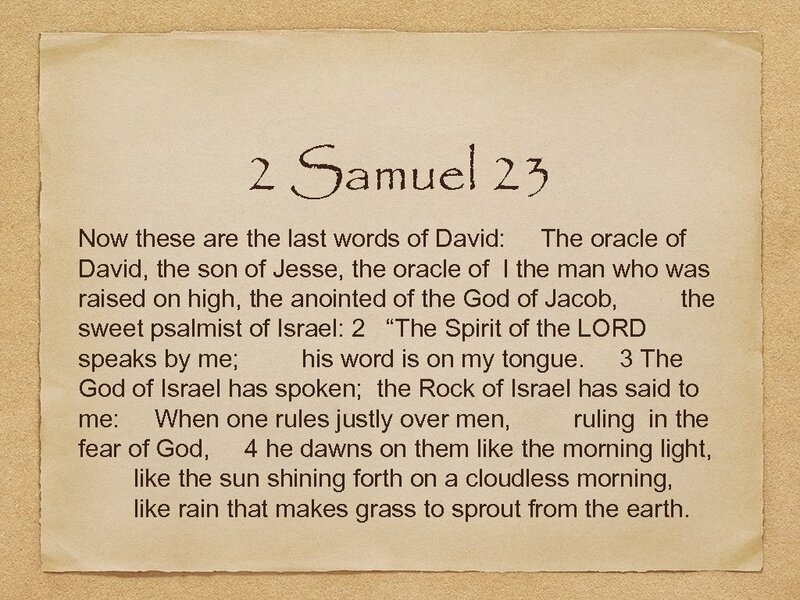 2 Samuel 23 Now these are the last words of David: The oracle of David, the son of Jesse, the oracle of l the man who was raised on high, the anointed of the God of Jacob, the sweet psalmist of Israel: 2 “The Spirit of the LORD speaks by me; his word is on my tongue. 3 The God of Israel has spoken; the Rock of Israel has said to me: When one rules justly over men, ruling in the fear of God, 4 he dawns on them like the morning light, like the sun shining forth on a cloudless morning, like rain that makes grass to sprout from the earth. 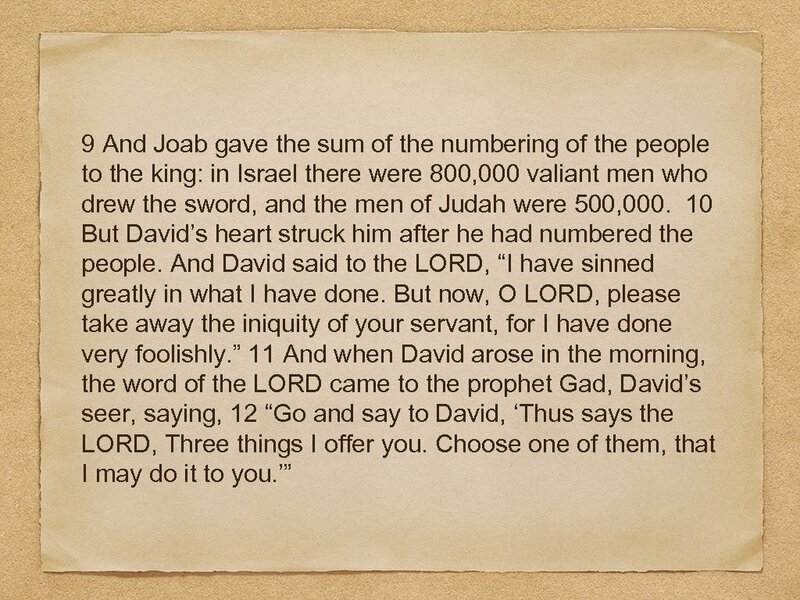 8 These are the names of the mighty men whom David had: Josheb-basshebeth a Tahchemonite; he was chief of the three. He wielded his spear against eight hundred whom he killed at one time. 9 And next to him among the three mighty men was Eleazar the son of Dodo, son of Ahohi. 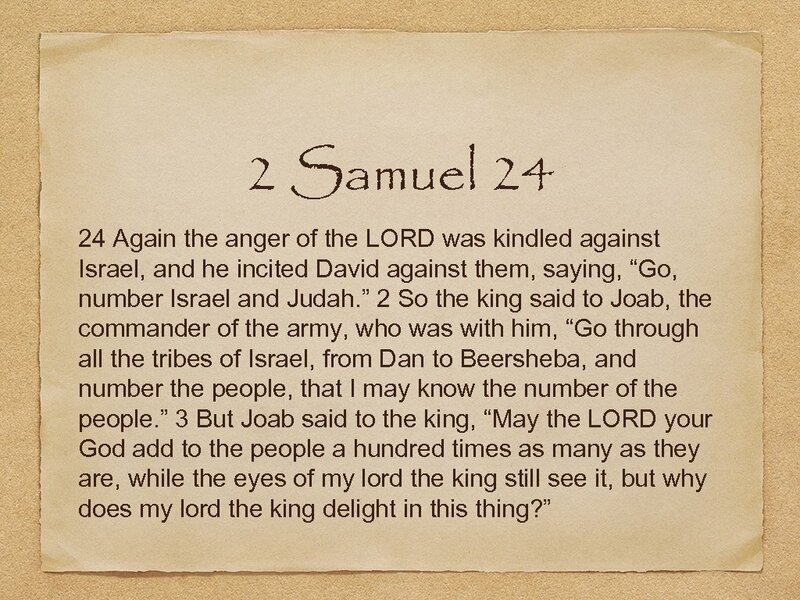 He was with David when they defied the Philistines who were gathered there for battle, and the men of Israel withdrew. 10 He rose and struck down the Philistines until his hand was weary, and his hand clung to the sword. And the LORD brought about a great victory that day, and the men returned after him only to strip the slain. 16 Then the three mighty men broke through the camp of the Philistines and drew water out of the well of Bethlehem that was by the gate and carried and brought it to David. But he would not drink of it. He poured it out to the LORD 17 and said, “Far be it from me, O LORD, that I should do this. Shall I drink the blood of the men who went at the risk of their lives? 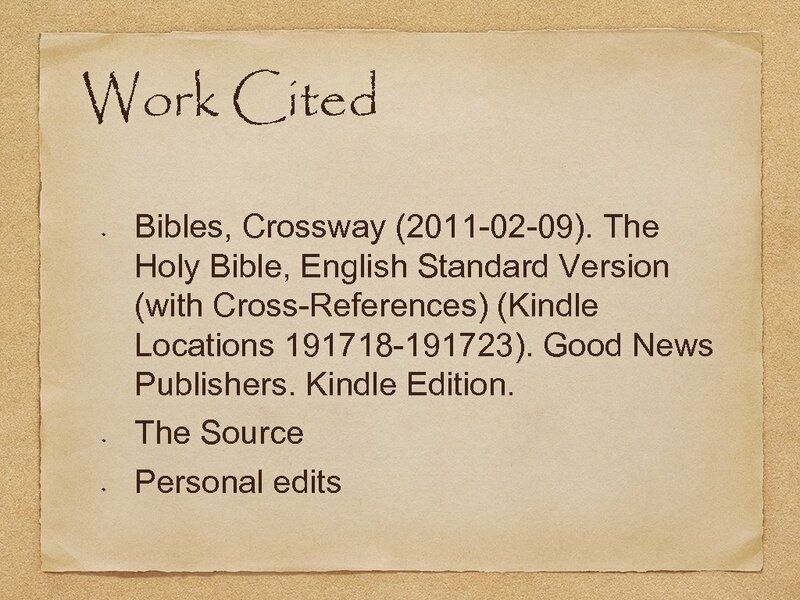 ” Therefore he would not drink it. These things the three mighty men did. 18 Now Abishai, the brother of Joab, the son of Zeruiah, was chief of the thirty. And he wielded his spear against three hundred men and killed them and won a name beside three. 19 He was the most renowned of the thirty and became their commander, but he did not attain to the three. 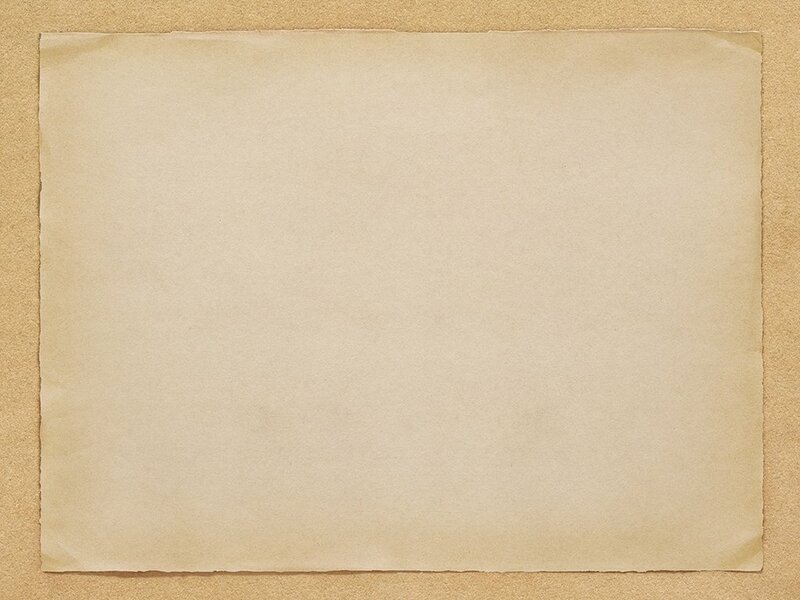 27 Abiezer of Anathoth, Mebunnai the Hushathite, 28 Zalmon the Ahohite, Maharai of Netophah, 29 Heleb the son of Baanah of Netophah, Ittai the son of Ribai of Gibeah of the people of Benjamin, 30 Benaiah of Pirathon, Hiddai of the brooks of Gaash, 31 Abi-albon the Arbathite, Azmaveth of Bahurim, 32 Eliahba the Shaalbonite, the sons of Jashen, Jonathan, 33 Shammah the Hararite, Ahiam the son of Sharar the Hararite, 34 Eliphelet the son of Ahasbai of Maacah, r Eliam the son of Ahithophel of Gilo, 35 Hezro of Carmel, Paarai the Arbite, 36 Igal the son of Nathan u of Zobah, Bani the Gadite, 37 Zelek the Ammonite, Naharai of Beeroth, the armorbearer of Joab the son of Zeruiah, 38 Ira the Ithrite, Gareb the Ithrite, 39 Uriah the Hittite: thirty-seven in all. 4 But the king’s word prevailed against Joab and the commanders of the army. So Joab and the commanders of the army went out from the presence of the king to number the people of Israel. 4 But the king’s word prevailed against Joab and the commanders of the army. So Joab and the commanders of the army went out from the presence of the king to number the people of Israel. 5 They crossed the Jordan and began from Aroer, and from the city that is in the middle of the f valley, toward Gad and on to Jazer. 6 Then they came to Gilead, and to Kadesh in the land of the Hittites; and they came to Dan, and from Dan they went around to h Sidon, 7 and came to the fortress of Tyre and to all the cities of the Hivites and Canaanites; and they went out to the Negeb of Judah at Beersheba. 8 So when they had gone through all the land, they came to Jerusalem at the end of nine months and twenty days. 13 So Gad came to David and told him, and said to him, “Shall three years of famine come to you in your land? Or will you flee three months before your foes while they pursue you? Or shall there be three days’ pestilence in your land? 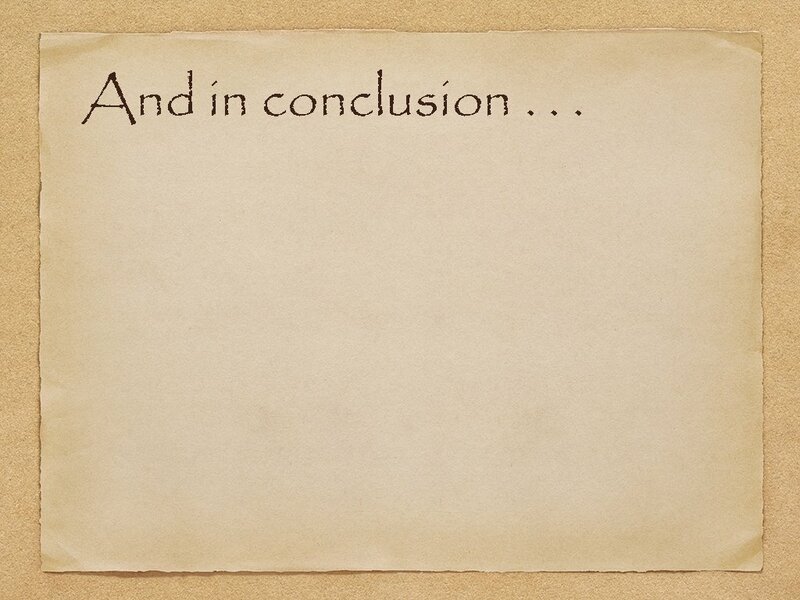 Now consider, and decide what answer I shall return to him who sent me. ” 14 Then David said to Gad, “I am in great distress. Let us fall into the hand of the LORD, for his mercy is great; but let me not fall into the hand of man. ” 15 So the LORD sent a pestilence on Israel from the morning until the appointed time. And there died of the people from Dan to Beersheba 70, 000 men. 22 Then Araunah said to David, “Let my lord the king take and offer up what seems good to him. Here are the oxen for the burnt offering and the threshing sledges and the yokes of the oxen for the wood. 23 All this, O king, Araunah gives to the king. ” And Araunah said to the king, “May the LORD your God accept you. 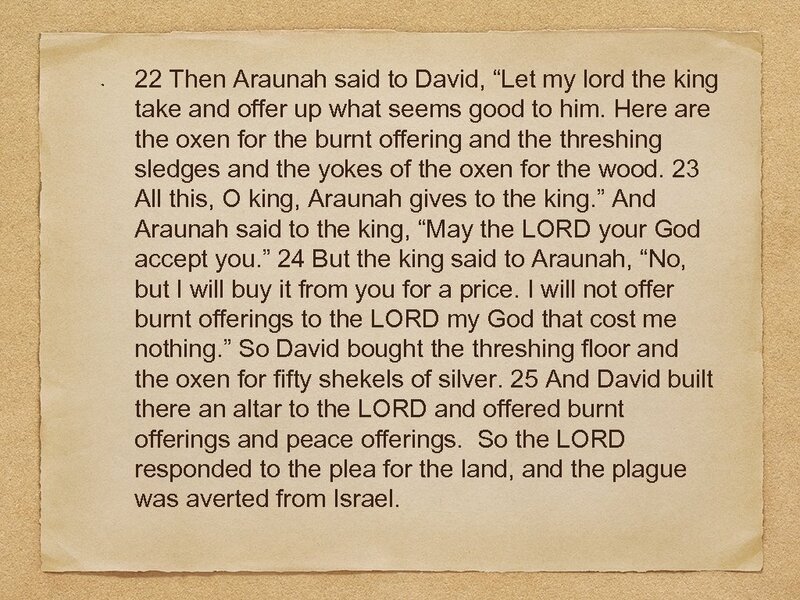 ” 24 But the king said to Araunah, “No, but I will buy it from you for a price. 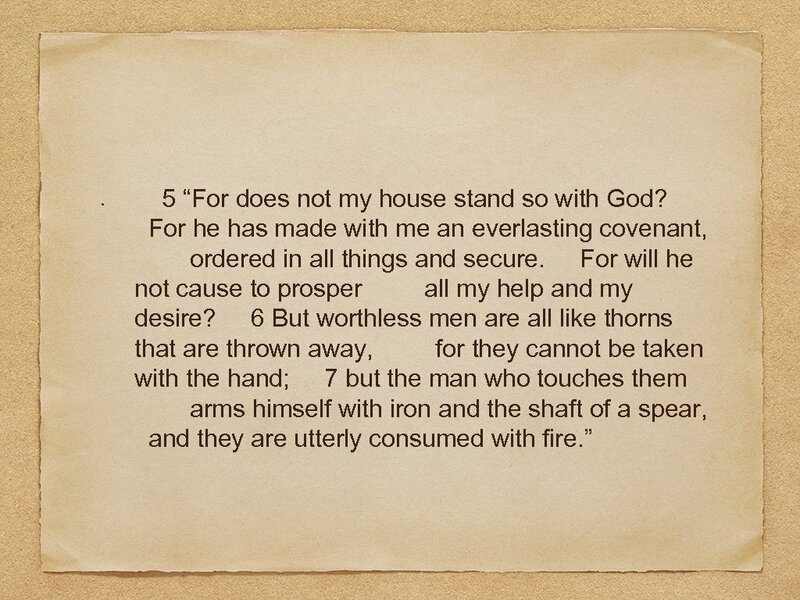 I will not offer burnt offerings to the LORD my God that cost me nothing. 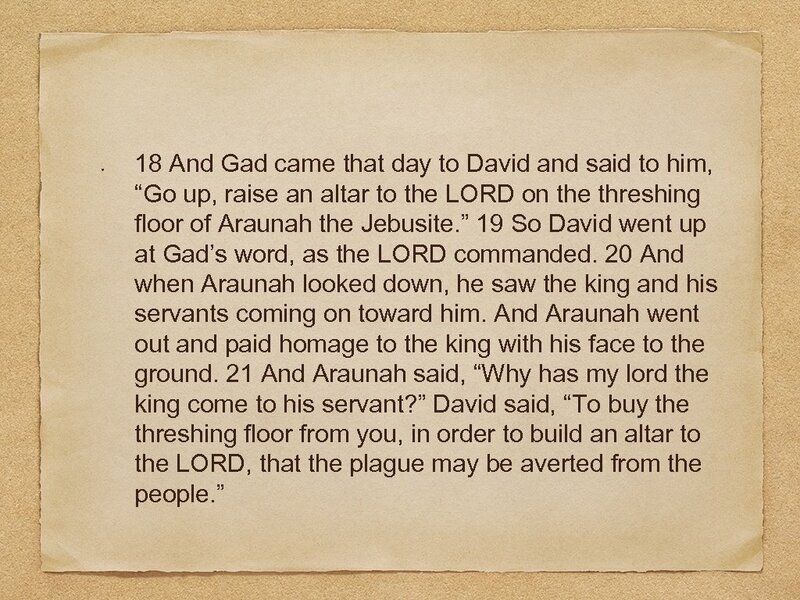 ” So David bought the threshing floor and the oxen for fifty shekels of silver. 25 And David built there an altar to the LORD and offered burnt offerings and peace offerings. 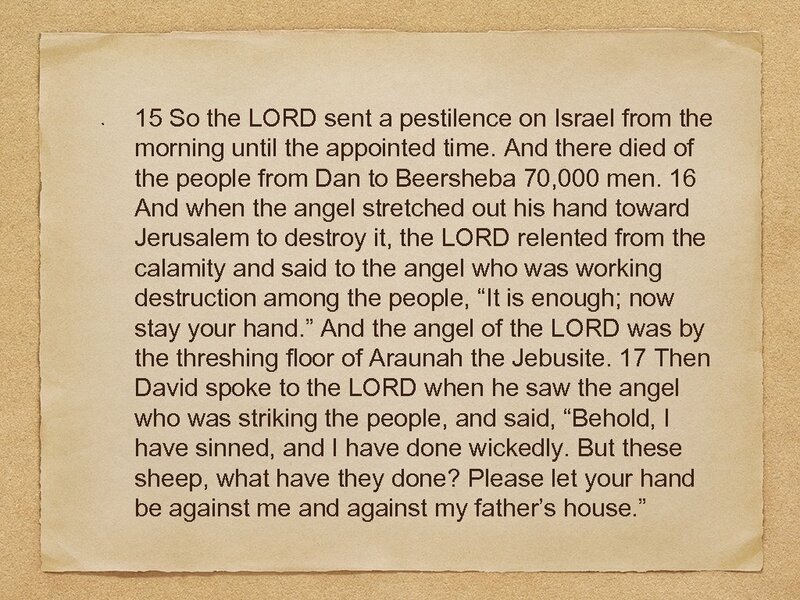 So the LORD responded to the plea for the land, and the plague was averted from Israel. 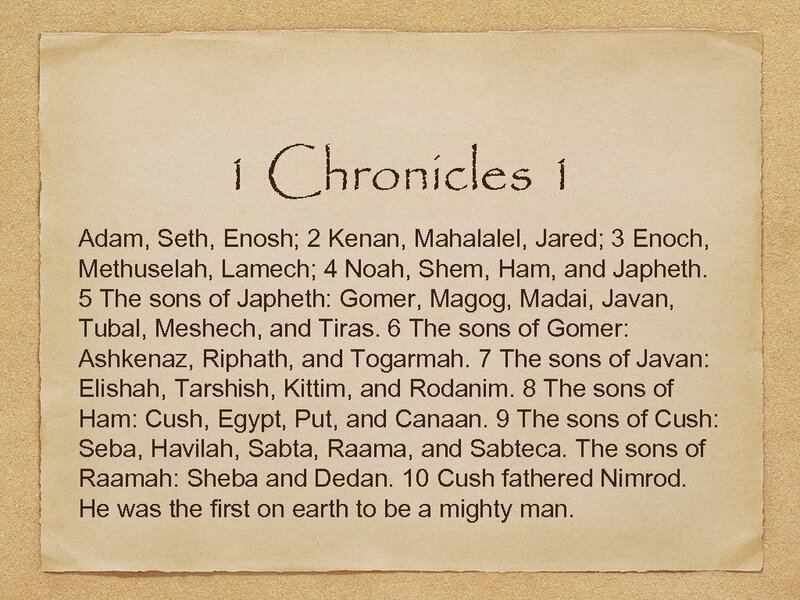 1 Chronicles 1 Adam, Seth, Enosh; 2 Kenan, Mahalalel, Jared; 3 Enoch, Methuselah, Lamech; 4 Noah, Shem, Ham, and Japheth. 5 The sons of Japheth: Gomer, Magog, Madai, Javan, Tubal, Meshech, and Tiras. 6 The sons of Gomer: Ashkenaz, Riphath, and Togarmah. 7 The sons of Javan: Elishah, Tarshish, Kittim, and Rodanim. 8 The sons of Ham: Cush, Egypt, Put, and Canaan. 9 The sons of Cush: Seba, Havilah, Sabta, Raama, and Sabteca. The sons of Raamah: Sheba and Dedan. 10 Cush fathered Nimrod. He was the first on earth to be a mighty man. 23 Ophir, Havilah, and Jobab; all these were the sons of Joktan. 24 Shem, Arpachshad, Shelah; 25 Eber, Peleg, Reu; 26 Serug, Nahor, Terah; 27 Abram, that is, Abraham. 28 The sons of Abraham: Isaac and Ishmael. 29 These are their genealogies: the firstborn of Ishmael, Nebaioth, and Kedar, Adbeel, Mibsam, 30 Mishma, Dumah, Massa, Hadad, Tema, 31 Jetur, Naphish, and Kedemah. These are the sons of Ishmael. 32 The sons of Keturah, Abraham’s concubine: she bore Zimran, Jokshan, Medan, Midian, Ishbak, and Shuah. The sons of Jokshan: Sheba and Dedan. 33 The sons of Midian: Ephah, Epher, Hanoch, Abida, and Eldaah. 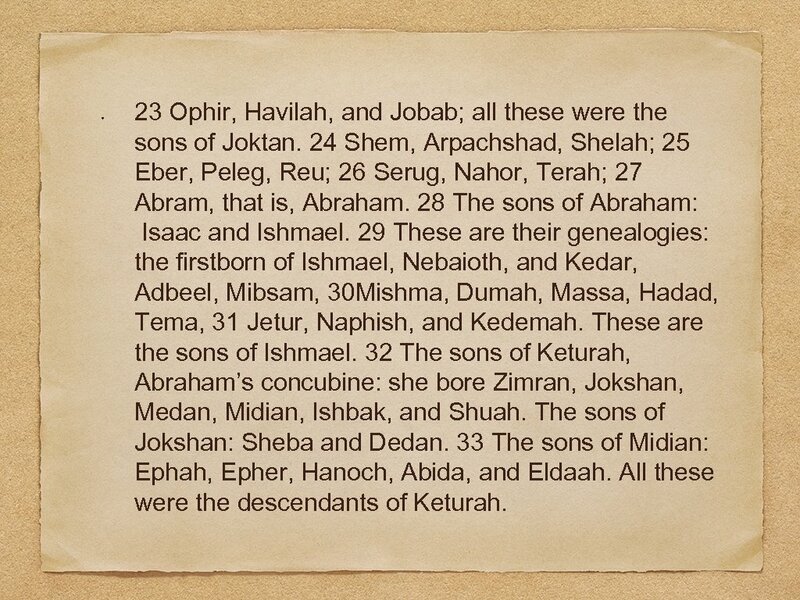 All these were the descendants of Keturah. 34 Abraham fathered Isaac. The sons of Isaac: Esau and Israel. 35 The sons of Esau: Eliphaz, Reuel, Jeush, Jalam, and Korah. 36 The sons of Eliphaz: Teman, Omar, Zepho, Gatam, Kenaz, and of Timna, Amalek. 37 The sons of Reuel: Nahath, Zerah, Shammah, and Mizzah. 38 The sons of Seir: Lotan, Shobal, Zibeon, Anah, Dishon, Ezer, and Dishan. 39 The sons of Lotan: Hori and Hemam; and Lotan’s sister was Timna. 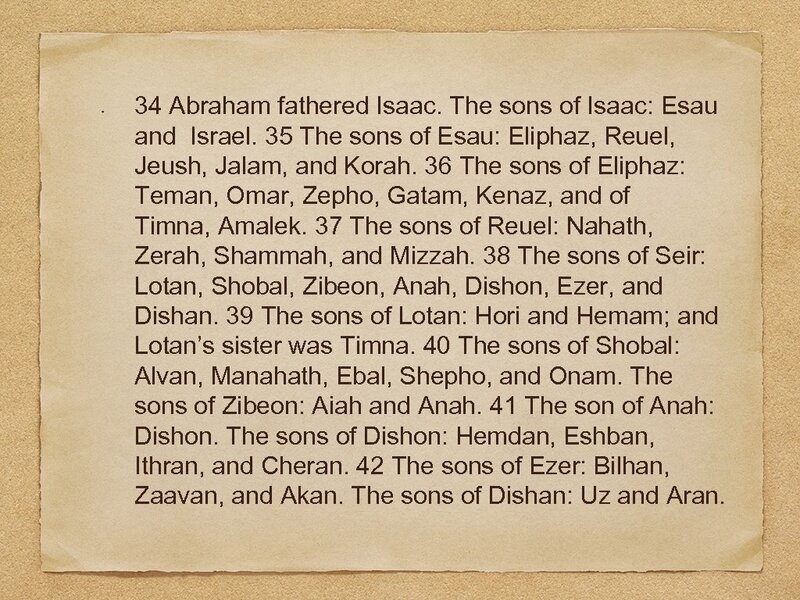 40 The sons of Shobal: Alvan, Manahath, Ebal, Shepho, and Onam. The sons of Zibeon: Aiah and Anah. 41 The son of Anah: Dishon. The sons of Dishon: Hemdan, Eshban, Ithran, and Cheran. 42 The sons of Ezer: Bilhan, Zaavan, and Akan. The sons of Dishan: Uz and Aran. 43 These are the kings who reigned in the land of Edom before any king reigned over the people of Israel: Bela the son of Beor, the name of his city being Dinhabah. 44 Bela died, and Jobab the son of Zerah of Bozrah reigned in his place. 45 Jobab died, and Husham of the land of the Temanites reigned in his place. 46 Husham died, and Hadad the son of Bedad, who defeated Midian in the country of Moab, reigned in his place, the name of his city being Avith. 47 Hadad died, and Samlah of Masrekah reigned in his place. 48 Samlah died, and Shaul of Rehoboth on the Euphrates reigned in his place. 49 Shaul died, and Baal-hanan, the son of Achbor, reigned in his place. 50 Baal-hanan died, and Hadad reigned in his place, the name of his city being Pai; and his wife’s name was Mehetabel, the daughter of Matred, the daughter of Mezahab. 51 And Hadad died. 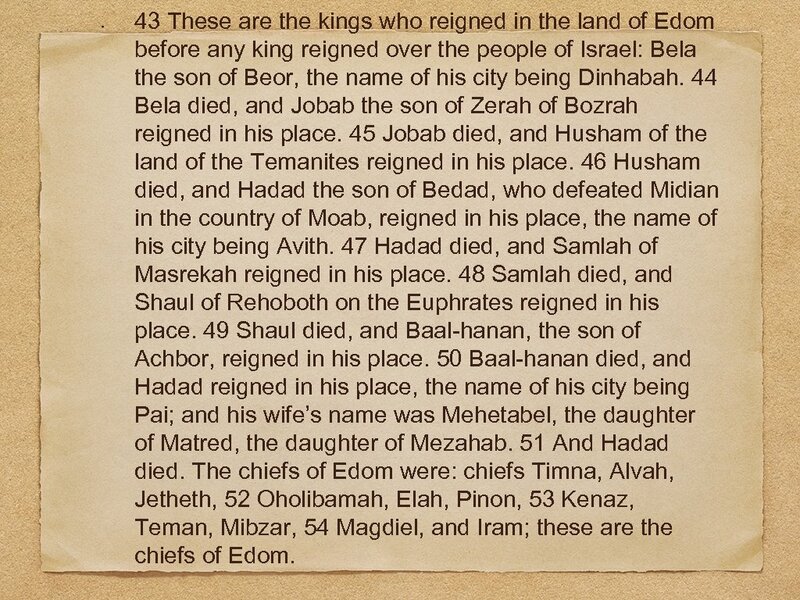 The chiefs of Edom were: chiefs Timna, Alvah, Jetheth, 52 Oholibamah, Elah, Pinon, 53 Kenaz, Teman, Mibzar, 54 Magdiel, and Iram; these are the chiefs of Edom. 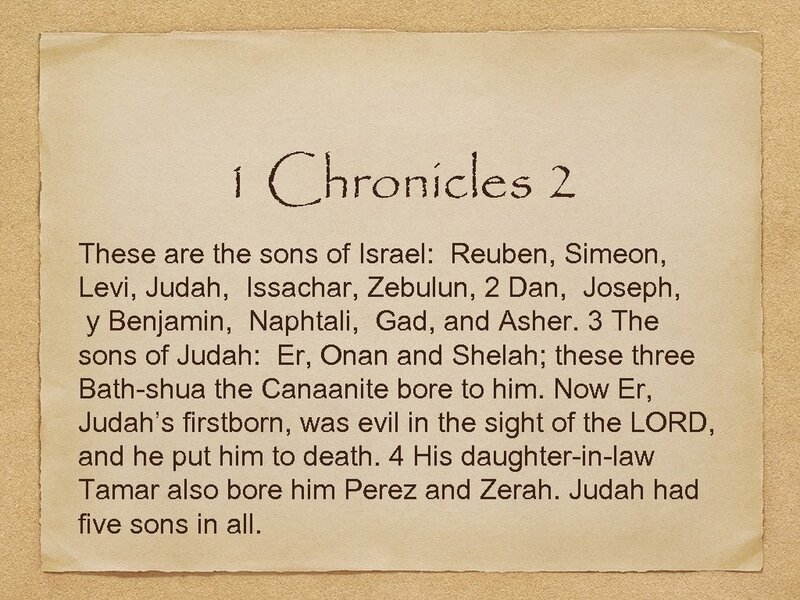 1 Chronicles 2 These are the sons of Israel: Reuben, Simeon, Levi, Judah, Issachar, Zebulun, 2 Dan, Joseph, y Benjamin, Naphtali, Gad, and Asher. 3 The sons of Judah: Er, Onan and Shelah; these three Bath-shua the Canaanite bore to him. Now Er, Judah’s firstborn, was evil in the sight of the LORD, and he put him to death. 4 His daughter-in-law Tamar also bore him Perez and Zerah. Judah had five sons in all. 5 The sons of Perez: Hezron and Hamul. 6 The sons of Zerah: Zimri, Ethan, Heman, Calcol, and Dara, five in all. 7 The son of Carmi: Achan, the troubler of Israel, who f broke faith in the matter of the devoted thing; 8 and Ethan’s son was Azariah. 9 The sons of Hezron that were born to him: Jerahmeel, Ram, and Chelubai. 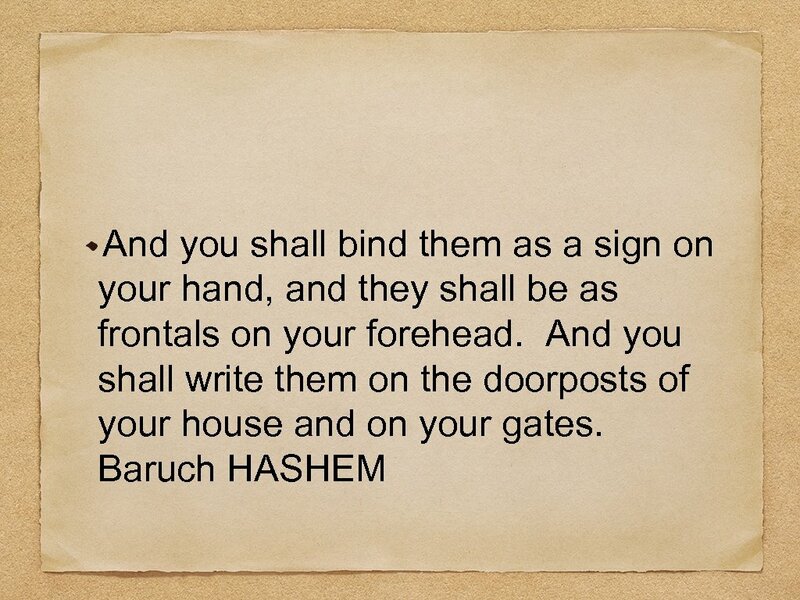 10 Ram fathered Amminadab, and Amminadab fathered Nahshon, prince of the sons of Judah. 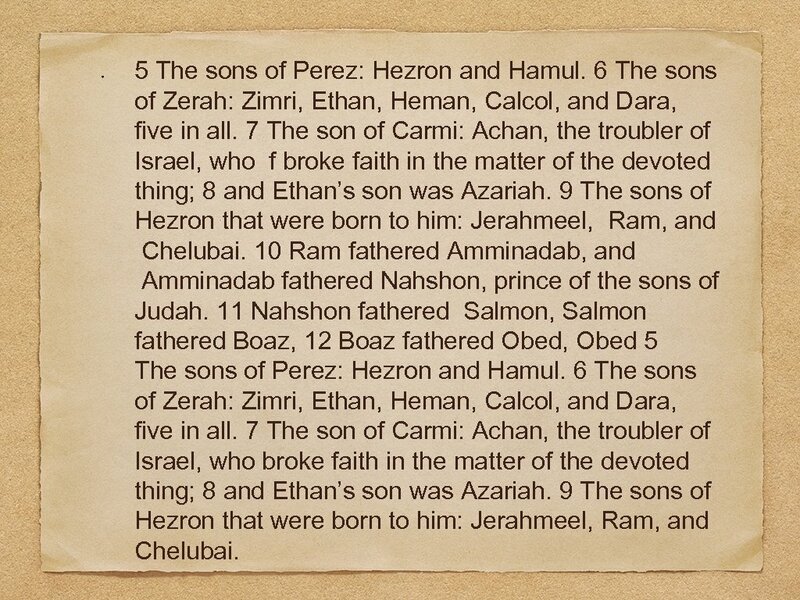 11 Nahshon fathered Salmon, Salmon fathered Boaz, 12 Boaz fathered Obed, Obed 5 The sons of Perez: Hezron and Hamul. 6 The sons of Zerah: Zimri, Ethan, Heman, Calcol, and Dara, five in all. 7 The son of Carmi: Achan, the troubler of Israel, who broke faith in the matter of the devoted thing; 8 and Ethan’s son was Azariah. 9 The sons of Hezron that were born to him: Jerahmeel, Ram, and Chelubai. 10 Ram fathered Amminadab, and Amminadab fathered Nahshon, prince of the sons of Judah. 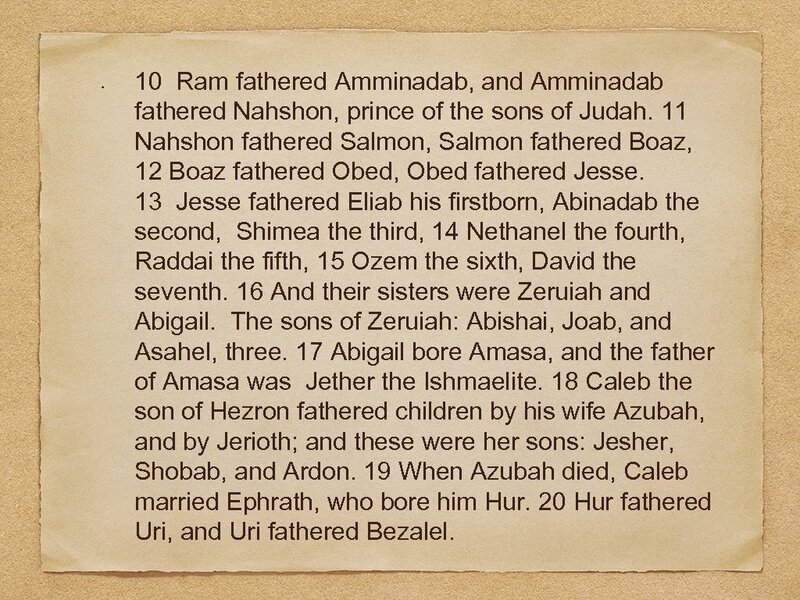 11 Nahshon fathered Salmon, Salmon fathered Boaz, 12 Boaz fathered Obed, Obed fathered Jesse. 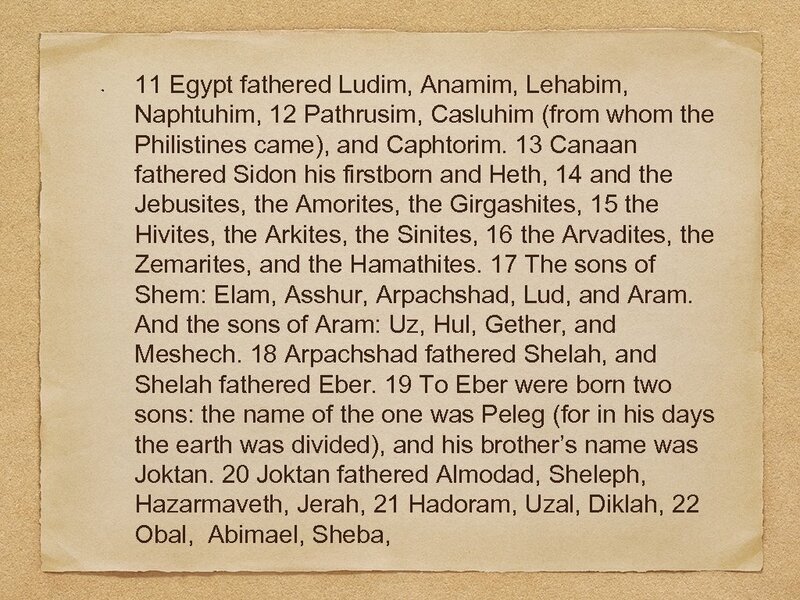 13 Jesse fathered Eliab his firstborn, Abinadab the second, Shimea the third, 14 Nethanel the fourth, Raddai the fifth, 15 Ozem the sixth, David the seventh. 16 And their sisters were Zeruiah and Abigail. 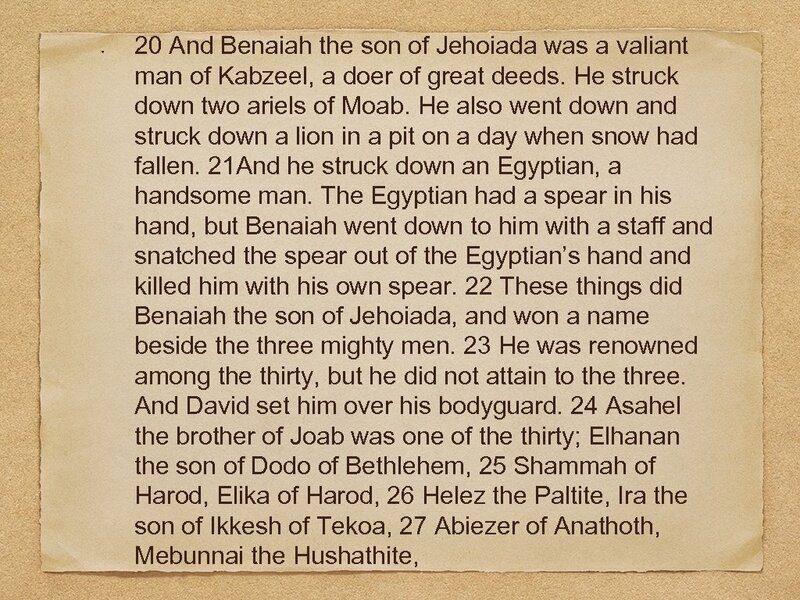 The sons of Zeruiah: Abishai, Joab, and Asahel, three. 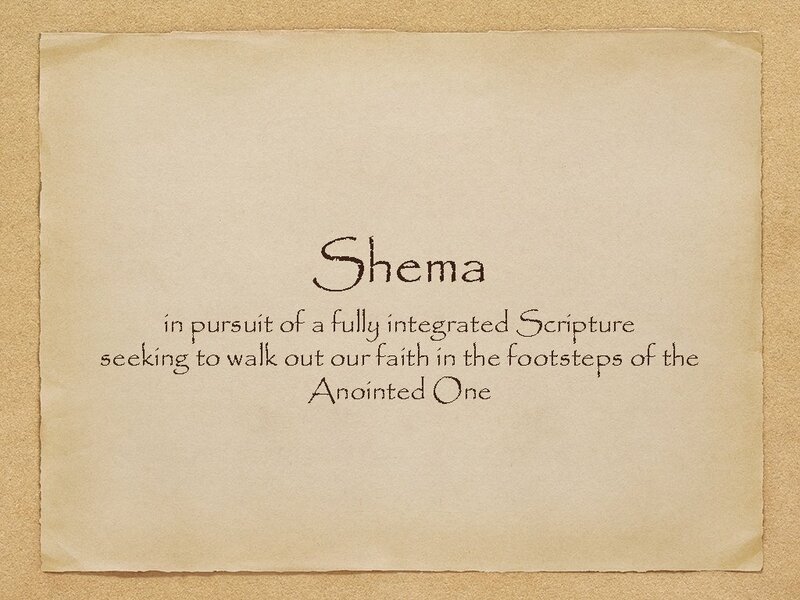 17 Abigail bore Amasa, and the father of Amasa was Jether the Ishmaelite. 18 Caleb the son of Hezron fathered children by his wife Azubah, and by Jerioth; and these were her sons: Jesher, Shobab, and Ardon. 19 When Azubah died, Caleb married Ephrath, who bore him Hur. 20 Hur fathered Uri, and Uri fathered Bezalel. 21 Afterward Hezron went in to the daughter of Machir the father of Gilead, whom he married when he was sixty years old, and she bore him Segub. 22 And Segub fathered Jair, who had twenty-three cities in the land of Gilead. 23 But Geshur and Aram took from them Havvoth-jair, Kenath, and its villages, sixty towns. 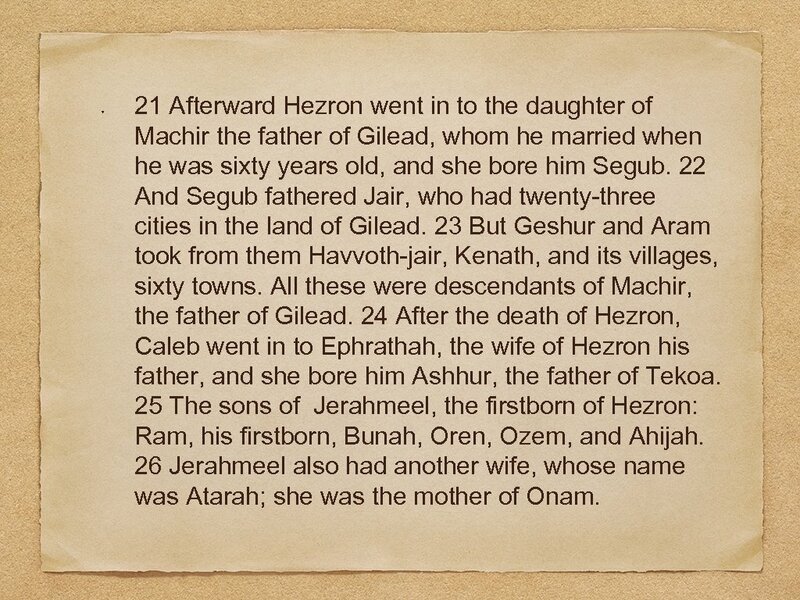 All these were descendants of Machir, the father of Gilead. 24 After the death of Hezron, Caleb went in to Ephrathah, the wife of Hezron his father, and she bore him Ashhur, the father of Tekoa. 25 The sons of Jerahmeel, the firstborn of Hezron: Ram, his firstborn, Bunah, Oren, Ozem, and Ahijah. 26 Jerahmeel also had another wife, whose name was Atarah; she was the mother of Onam. 27 The sons of Ram, the firstborn of Jerahmeel: Maaz, Jamin, and Eker. 28 The sons of Onam: Shammai and Jada. The sons of Shammai: Nadab and Abishur. 29 The name of Abishur’s wife was Abihail, and she bore him Ahban and Molid. 30 The sons of Nadab: Seled and Appaim; and Seled died childless. 31 The son of Appaim: Ishi. The son of Ishi: Sheshan. The son of Sheshan: Ahlai. 32 The sons of Jada, Shammai’s brother: Jether and Jonathan; and Jether died childless. 33 The sons of Jonathan: Peleth and Zaza. These were the descendants of Jerahmeel 34 Now Sheshan had no sons, only daughters, but Sheshan had an Egyptian slave whose name was Jarha. 35 So Sheshan gave his daughter in marriage to Jarha his slave, and she bore him Attai. 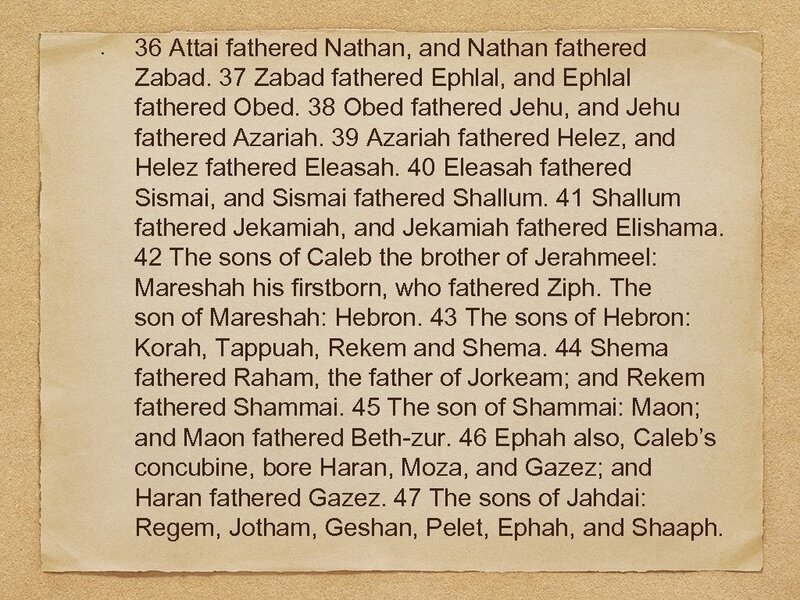 36 Attai fathered Nathan, and Nathan fathered Zabad. 37 Zabad fathered Ephlal, and Ephlal fathered Obed. 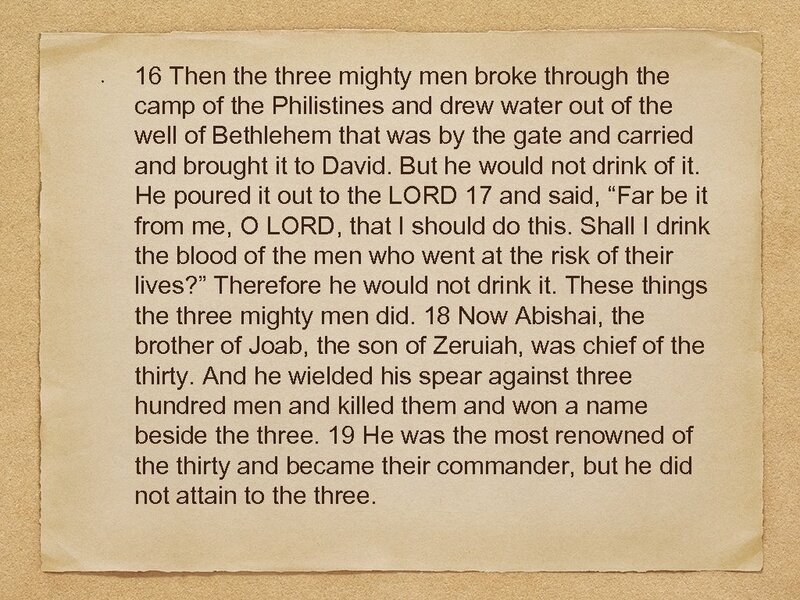 38 Obed fathered Jehu, and Jehu fathered Azariah. 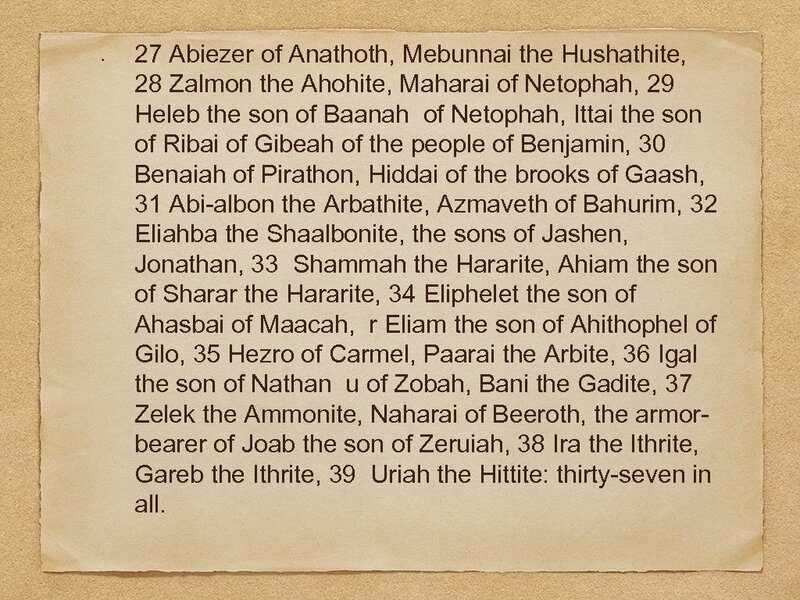 39 Azariah fathered Helez, and Helez fathered Eleasah. 40 Eleasah fathered Sismai, and Sismai fathered Shallum. 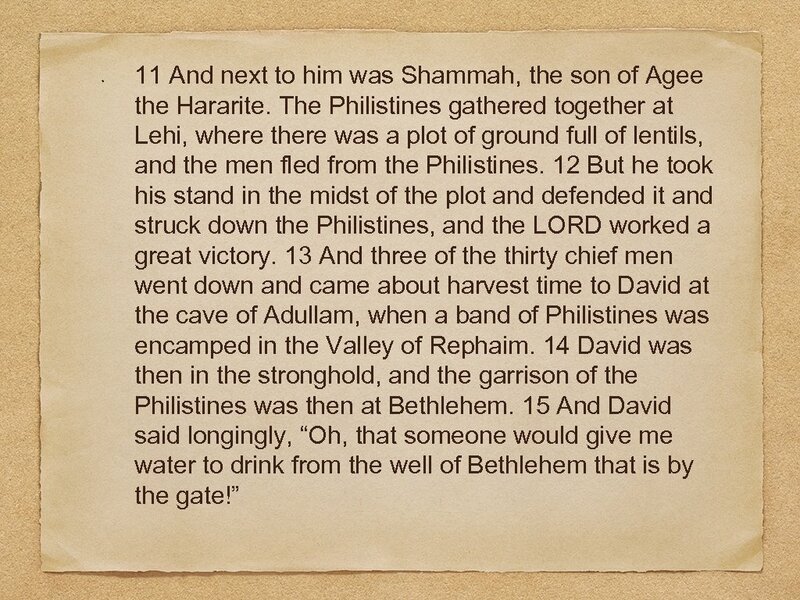 41 Shallum fathered Jekamiah, and Jekamiah fathered Elishama. 42 The sons of Caleb the brother of Jerahmeel: Mareshah his firstborn, who fathered Ziph. The son of Mareshah: Hebron. 43 The sons of Hebron: Korah, Tappuah, Rekem and Shema. 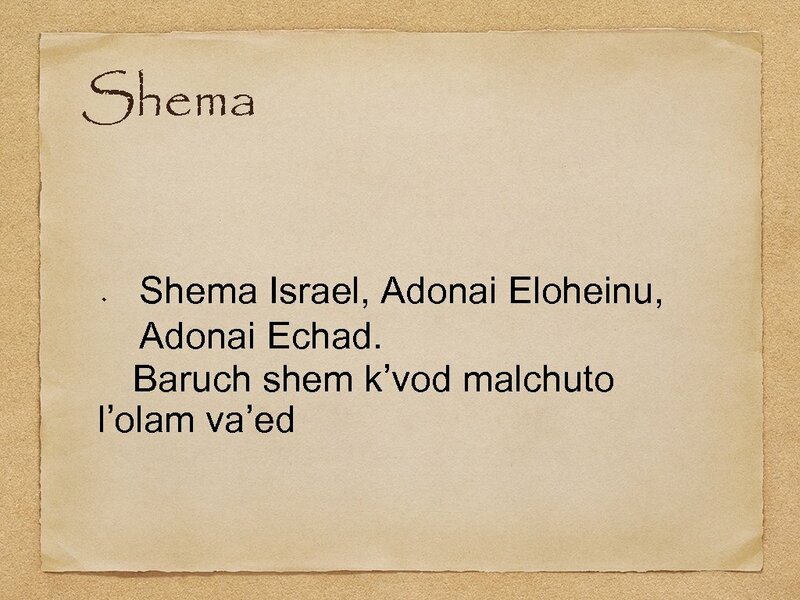 44 Shema fathered Raham, the father of Jorkeam; and Rekem fathered Shammai. 45 The son of Shammai: Maon; and Maon fathered Beth-zur. 46 Ephah also, Caleb’s concubine, bore Haran, Moza, and Gazez; and Haran fathered Gazez. 47 The sons of Jahdai: Regem, Jotham, Geshan, Pelet, Ephah, and Shaaph. 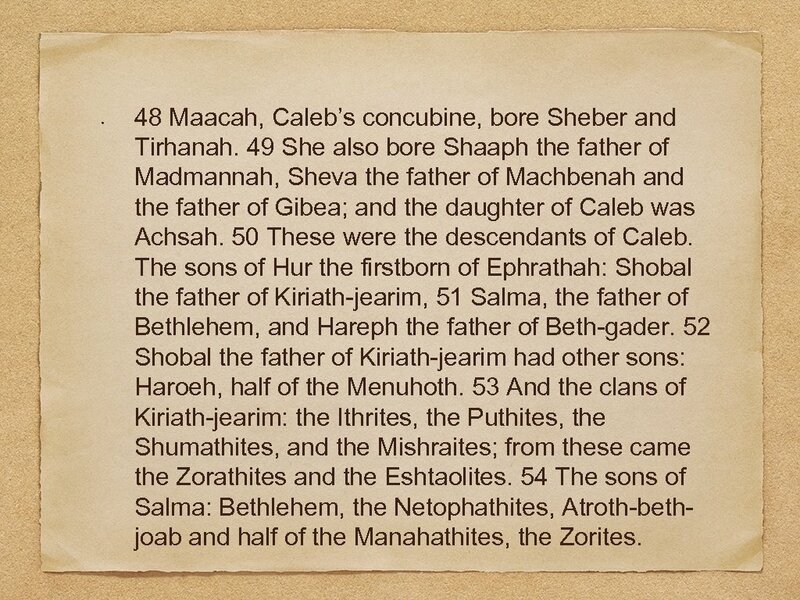 48 Maacah, Caleb’s concubine, bore Sheber and Tirhanah. 49 She also bore Shaaph the father of Madmannah, Sheva the father of Machbenah and the father of Gibea; and the daughter of Caleb was Achsah. 50 These were the descendants of Caleb. The sons of Hur the firstborn of Ephrathah: Shobal the father of Kiriath-jearim, 51 Salma, the father of Bethlehem, and Hareph the father of Beth-gader. 52 Shobal the father of Kiriath-jearim had other sons: Haroeh, half of the Menuhoth. 53 And the clans of Kiriath-jearim: the Ithrites, the Puthites, the Shumathites, and the Mishraites; from these came the Zorathites and the Eshtaolites. 54 The sons of Salma: Bethlehem, the Netophathites, Atroth-bethjoab and half of the Manahathites, the Zorites. 55 The clans also of the scribes who lived at Jabez: the Tirathites, the Shimeathites and the Sucathites. 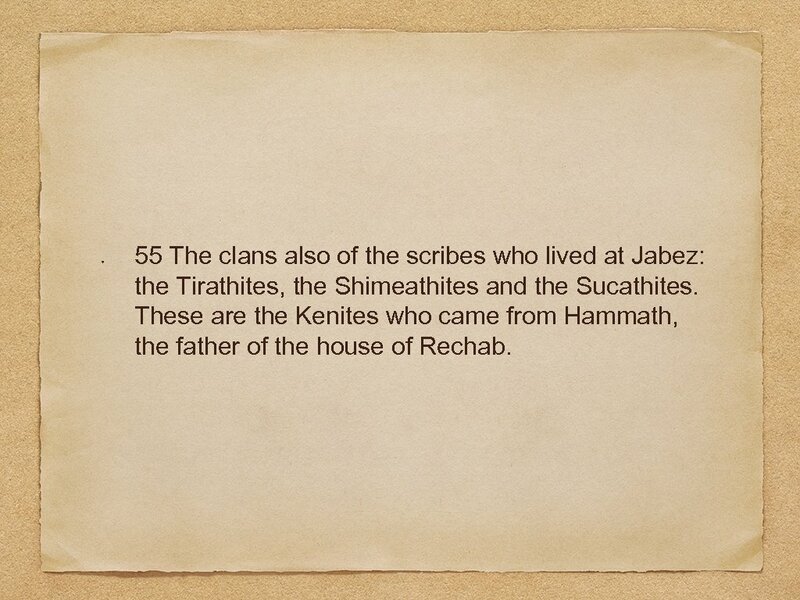 These are the Kenites who came from Hammath, the father of the house of Rechab. 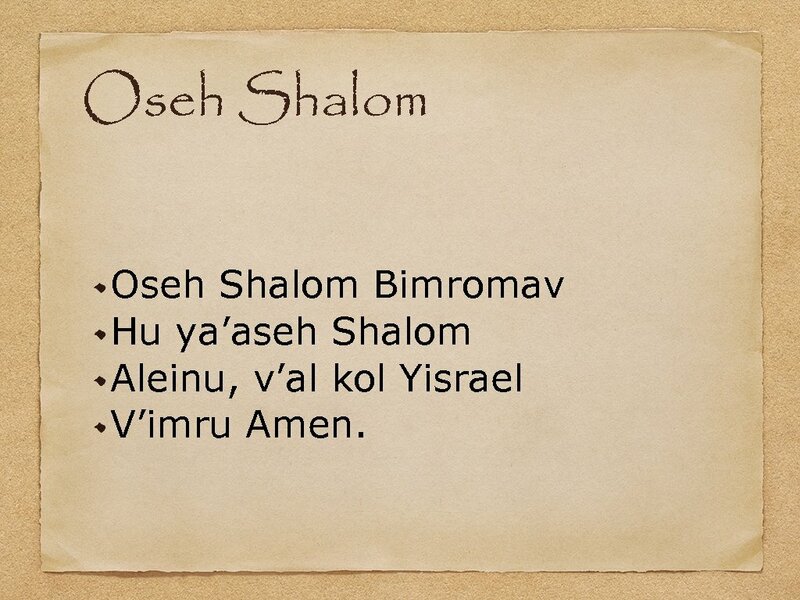 Oseh Shalom Bimromav Hu ya’aseh Shalom Aleinu, v’al kol Yisrael V’imru Amen. 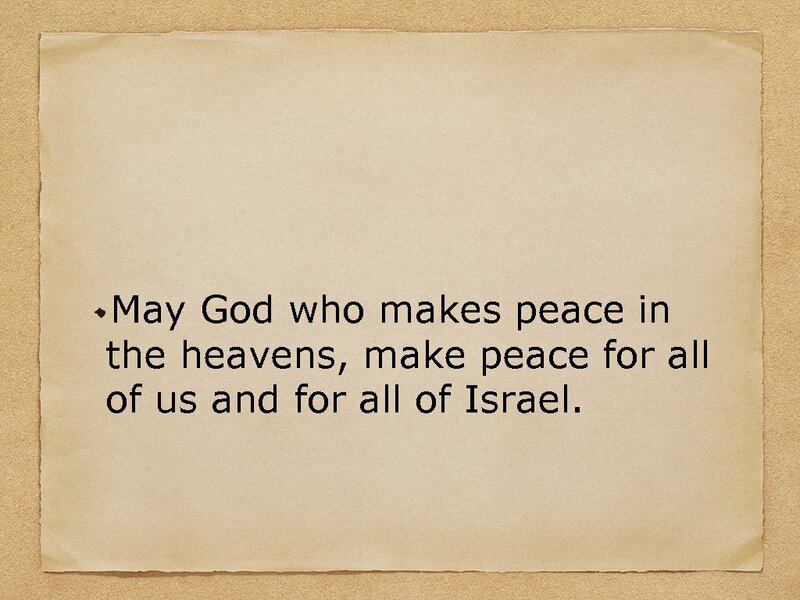 May God who makes peace in the heavens, make peace for all of us and for all of Israel.